I’m in the process of getting my tattoo removed at Treasure Valley Tattoo Removal. I did about nine sessions at another place in California and had to find a new place when I moved. I have done two sessions so far here, and I have to say that they are much better than the treatments I was getting at the other place. Much more ink seems to be breaking down with these sessions. I am looking forward to getting this tattoo off my body. They have been helping me to remove a tattoo I need gone before I leave for military basic training. They are very knowledgeable and honest, better prices than anywhere else I have gone. Had my first session today, free from the fair raffle. Surprisingly super affordable and Zane did a killer job. Speed & precision was amazing. Good conversations as well. Overall a great experience, look forward to the next few sessions. Always had a great experience, they work well with your schedule. 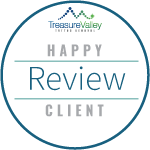 Exceptional customer service, more than accommodating when making appointments and they make the process as painless as possible. Highly recommend! They are always so quick and on time for my appointments, for the most part. I don’t think I’ve ever waited more than 5-10 minutes after my scheduled time. They are all very friendly and welcoming, and always seen happy to help.